Two members of the AAFE family received honors during the past month for their dedication to our community. 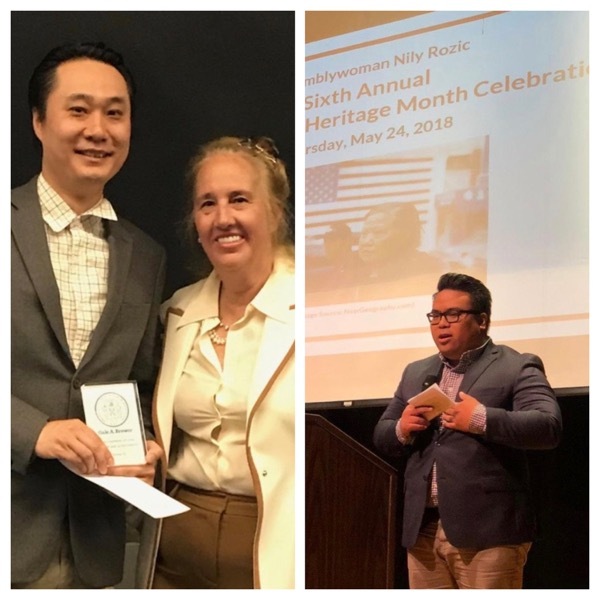 On Tuesday, May 29, Manhattan Borough President Gale Brewer recognized Thomas Yu, AAFE’s Strategic Development Officer, during a celebration of Asian American and Pacific Islander Heritage Month. Thomas plays a leading role in AAFE’s creation and preservation of affordable housing. He also served as chairperson of Community Board 3’s Parks Committee for a decade, among numerous other civic activities. You can read more about the awards ceremony in World Journal. Gabriel Hisugan, an AAFE youth organizer in Queens, was recognized by State Assembly member Nily Rozic May 24, at another APA Heritage Month event. Gabe received praise for his excellent work with the students and parents at Flushing High School, Flushing International High School and the Queens High School for Language Studies. Read more about the Flushing celebration here.